Michael Brian Young (born October 19, 1976) is an American former professional baseball infielder who played 14 seasons in Major League Baseball (MLB) for the Texas Rangers, Philadelphia Phillies, and Los Angeles Dodgers. Originally a second baseman, the versatile Young was a five time All-Star at shortstop, once at third base, and once as a combination designated hitter and utility infielder. He was the 2005 American League batting champion. Young played baseball in high school at Bishop Amat Memorial High School and in college at University of California, Santa Barbara (UC-Santa Barbara). He was originally drafted by the Baltimore Orioles in 1994, but elected to return to college and was eventually drafted in 1997 by the Toronto Blue Jays. After spending several seasons in the minor leagues with the Blue Jays, Young was traded to the Rangers where he spent over a decade. While with the Rangers, he set several club records in offensive statistic categories including runs scored and total bases. In 2016, Young was inducted into the Texas Rangers Hall of Fame. Young made his professional debut in 1997 with the St. Catharines Blue Jays in the New York–Penn League (NY-Penn) (short-season A). Among his achievements in the NY-Penn League were a 16-game hitting streak, tying for fifth in the league with 48 RBIs, and tying for third in the league with 136 total bases. In 1998, he spent the season with the Hagerstown Suns of the South Atlantic League. Playing second base, he led all players at his position in fielding percentage. 1999 would be an all-star season for Young. Playing for the Dunedin Blue Jays of the Florida State League, he earned spots on both the midseason and postseason all star teams by leading the league in doubles and finishing fourth in batting average and hits, .313 and 155 respectively. After the regular season, he played for the Rancho Cucamonga Quakes in the California Fall League. He split 2000 between Double-A and Triple-A and, on July 19, was traded to the Rangers. The Rangers purchased his contract on September 27 and he played the final five games of the season in the majors making his debut as a pinch runner. Though he began, 2001 in Triple-A, he was recalled to the majors on May 25 and did not return to the minors at all during the season. At the conclusion of the 2006 MLB All-Star Game held at PNC Park in Pittsburgh, Young was awarded the Ted Williams Major League Baseball All-Star Game MVP Award after hitting a game-winning two-run triple in the ninth inning. Young led the American League in fielding percentage at shortstop with .981. Young also played all 162 games of the 2006 season. 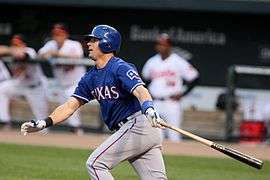 On June 16, 2010, Young hit a ground ball up the middle to collect his 1,748th career hit, and pass Iván Rodríguez to become the Rangers' career leader in hits. On defense, in 2010 he tied for the AL lead in errors by a third baseman, with 19, and had the lowest fielding percentage among them, at .950. Young agreed to waive his no-trade clause and on December 9, 2012, was traded to the Phillies in exchange for pitcher Josh Lindblom and minor league pitcher Lisalverto Bonilla. The deal reunited him with former teammates Laynce Nix, Cliff Lee and Mike Adams. The Phillies were monitoring Young for some time prior to his acquisition. Their former Hall of Fame third baseman Mike Schmidt said, "we got a Derek Jeter kind of player on our team all of a sudden ... He's two or three Michael Young years away from being a Hall of Famer, first ballot maybe." Phillies general manager Rubén Amaro, Jr. and manager Charlie Manuel also were fond of Young and made him a target headed into the Winter Meetings. Once they agreed to a deal, Young had to approve it, which he did, later mentioning that he would only have done so to go to a winning team like the Phillies. The Phillies viewed Young as a stop-gap to get them to top prospect Cody Asche. On November 5, 2014, Young was hired by the Texas Rangers as a special assistant to general manager Jon Daniels. He was key in the offseason acquisition of Outfielder Ian Desmond in 2016. On July 30, 2016, Young was inducted into the Texas Rangers Baseball Hall of Fame in a pregame ceremony before the team's matchup with the Kansas City Royals. ↑ "Michael Young". The Baseball Cube. Retrieved October 25, 2010. ↑ "Alumnus Starting in World Series". The Daily Nexus. October 27, 2010. Retrieved October 27, 2010. ↑ Newberg, Jamey (July 19, 2007). "Swapping Stories: The Young trade". texasrangers.com: News. MLB Advanced Media. Retrieved May 22, 2013. 1 2 Clark, Bonnie, ed. (February 2013). 2013 Philadelphia Phillies Media Guide. Philadelphia: The Phillies. pp. 181–184. ↑ "Texas Rangers sign Michael Young to contract extension". texasrangers.com: Official Info. MLB Advanced Media. March 2, 2007. Retrieved June 26, 2013. ↑ "2004 American League Batting Leaders". Baseball-Reference.com. Retrieved June 26, 2013. ↑ Branch, Chris (June 6, 2013). "Michael Young is hitting leadoff for the first time since 2004". Courier-Post. South Jersey. Retrieved June 26, 2013. ↑ "2005 American League Batting Leaders". Baseball-Reference.com. Retrieved June 26, 2013. ↑ Sullivan, T.R. (February 15, 2006). "Teixeira, Young tabbed for Team USA". worldbaseballclassic.com – MLB.com: News. MLB Advanced Media. Retrieved March 4, 2014. ↑ Associated Press. "Rangers' Michael Young named All-Star MVP after two out rally in the ninth". KTEN.com. WorldNow and KTEN. Retrieved June 26, 2013. ↑ "Michael Young Stats, Video Highlights, Photos, Bio". phillies.com: Team. MLB Advanced Media. Retrieved June 26, 2013. ↑ "Texas Rangers sign Michael Young to contract extension". MLB.com. January 15, 2009. Retrieved August 4, 2009. ↑ Sullivan, T.R. (March 2, 2007). "Young helps Rangers build stability". MLB.com. Retrieved August 4, 2009. ↑ Sullivan, T.R. (January 15, 2009). "Young will shift to third base". MLB.com. Retrieved August 4, 2009. 1 2 Grant, Evan (December 8, 2012). "Sources: Michael Young willing to accept trade to Philadelphai; details still must be finalized". Dallas Morning News. Texas Rangers Blog. Retrieved April 14, 2013. ↑ Sullivan, T. R. (April 19, 2009). "Young's walk-off homer lifts Rangers". MLB.com. Retrieved April 25, 2010. ↑ Sullivan, T. R. (July 16, 2010). "Young now tops on Texas' all-time hit list". MLB.com. Retrieved July 16, 2010. ↑ "2010 Regular Season MLB Baseball 3B Fielding Statistics". Espn.go.com. Retrieved October 18, 2011. ↑ "Rosenthal: Michael Young Q&A". Msn.foxsports.com. February 8, 2011. Retrieved October 3, 2011. 1 2 3 "Michael Young Statistics and History". Baseball-Reference.com. Retrieved October 3, 2011. ↑ Tesfatsion, Master (August 8, 2011). "Texas Rangers' Michael Young collects his 2,000th career hit". ESPN Dallas. Retrieved December 8, 2012. 1 2 3 "Texas Rangers Top 10 Batting Leaders". Baseball-Reference.com. Retrieved April 14, 2013. ↑ Hagen, Paul. "Phillies acquire veteran Michael Young from Rangers". phillies.com: News. MLB Advanced Media. Retrieved December 8, 2012. ↑ Sullivan, T. R. (December 9, 2012). "Rangers deal Michael Young to Phils for two right-handers". MLB.com: News. Retrieved December 9, 2012. ↑ Hagen, Paul (April 2013). Bonnie, Clark, ed. "Young Professional". Phillies Magazine. Philadelphia: Philadelphia Phillies. 2013 (1): 33–36. ↑ Brookover, Bob (September 2, 2013). "Phillies Notes: Phils add well-traveled lefty in Michael Young trade". The Philadelphia Inquirer. Retrieved September 2, 2013. ↑ Randhawa, Manny (September 1, 2013). "Young left lasting impression in short Philly stint". phillies.com: News. MLB Advanced Media. Retrieved September 2, 2013. ↑ Shaikin, Bill (September 1, 2013). "New Dodger Michael Young: Has he been a regular, or not?". The Los Angeles Times. Retrieved September 2, 2013. ↑ Shaikin, Bill (September 1, 2013). "New Dodger Michael Young: Has he been a regular, or not?". Los Angeles Times. ↑ Gurnick, Ken (September 2, 2013). 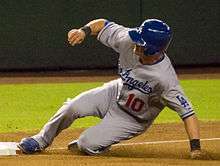 "Los Angeles Dodgers at Colorado Rockies – September 2, 2013". MLB.com Recap. Retrieved September 2, 2013. ↑ Gleeman, Aaron (January 30, 2014). "Michael Young is retiring". HardballTalk. NBC Sports. Retrieved January 30, 2014. ↑ Sullivan, T. R. (January 30, 2014). "Longtime Rangers staple Young retires". mlb.com. Retrieved January 31, 2014. ↑ Watkins, Calvin (November 5, 2014). "Michael Young back with Rangers". ESPN. Retrieved July 30, 2016. ↑ Wilson, Jeff (July 30, 2016). "Michael Young on joining Rangers Hall of Fame". Star Telegram. Retrieved July 30, 2016. ↑ "Michael Young Biography". JockBio. October 19, 1976. Retrieved October 25, 2010. ↑ "Texas Rangers News". Dallas Morning News. July 16, 2006. Retrieved October 25, 2010. ↑ "Wipe Out Kids' Cancer: Home". Wokc.org. May 1, 2010. Retrieved October 25, 2010. ↑ Heyman, Jon (March 2, 2011). "For Michael Young, it's business as usual". SI.com – Daily Scoop. Time. Retrieved April 14, 2013. ↑ Andro, Anthony (November 3, 2011). "Young tabbed Marvin Miller Man of the Year". Fox Sports Southwest. FOX Sports Interactive Media. Retrieved May 22, 2013. ↑ "Michael Young: Biography and Career Highlights". Texas.rangers.mlb.com. Retrieved October 25, 2010. Wikimedia Commons has media related to Michael Young (baseball).